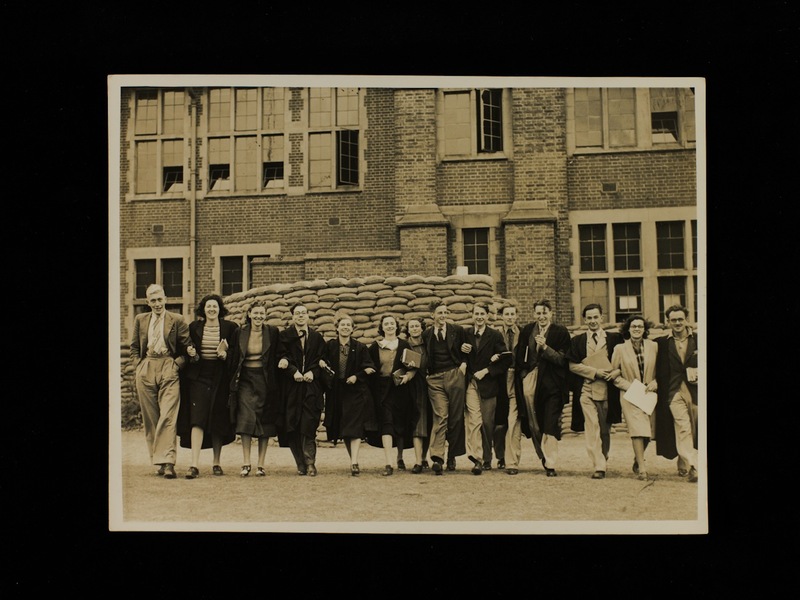 To mark the 50th anniversary of the death of Siegfried Sassoon, this blog will look at a number of collections in the Special Collections reflecting on warfare in the 20th century. These include two poems by the long-time friend of Sassoon, Edmund Blunden. Edmund Blunden (1896-1974) was the longest serving First World War poet, and saw continuous action in the front line, between 1916-18. According to his friend and fellow poet Siegfried Sassoon, Blunden was the poet of the war “most lastingly obsessed by it”. The period that Blunden served at the front saw some of the most violent and bloody fighting, including the Battle of the Somme and the Third Battle of Ypres. He had very definite views on war writing, insisting that it had to be accurate in detail and in spirit and he shared with Sassoon a belief that the First World War had been a terrible waste of life. The Special Collections holds two of Blunden’s poems (MS10): fair copies of ‘Portrait of a colonel’ and ‘The passer-by’. Both were published in Retreat (London, 1928) with the former renamed as ‘On a portrait of a colonel’. A more substantial literary collection held at Southampton is MS328, that of Frank Templeton Prince (1912-2003). 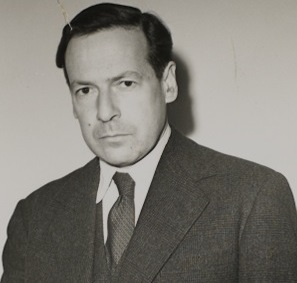 He is probably best remembered for his collection Soldiers Bathing (1954), the title poem of which is one of the most anthologised poems of the Second World War. 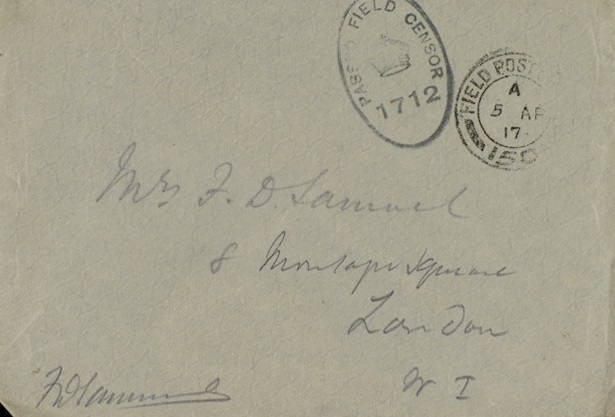 His archive collection contains not only notebooks and drafts of poems and prose writing, 1920s-87, but long series of correspondence, including correspondence with Edmund Blunden, 1932-58. The collection (MS376) of the poet Judith Lask Grubler provides very different reflections on warfare during the Second World War, drawing as she does a picture from the home front. In her writings, which date from the 1930s onwards, Grubler gives a contemporary account in such war related poems as ‘After the raids’ of the experience of civilians facing bombing raids on London. Other papers reflecting on war include: diaries of Revd Michael Adler (MS125); letters and diary of Private Paul Epstein (MS124); correspondence and diaries of Leonard Stein (MS170); correspondence of Fred Salinger, Gallipoli (MS209); and correspondence of Frederick Dudley Samuel (MS336). Revd Adler was one of a small number of Jewish chaplains attached to the forces in France. He, along with his colleagues worked tirelessly to visit the camps, training areas and hospitals to fulfil their pastoral duties. The four diaries that Adler kept for this period provide a brief record of his activities during his tours of duty rather than an analytical or personal account of his experiences as chaplain. They are detached and sparse in their detail and tone, as befits the type of record they represent, but also perhaps representing the need for detachment in dealing with a traumatic situation. The collections at Southampton provide a range of material and of experiences of 20th-century warfare and the reflections they contain still speak to us as loudly today as they ever did. As of March 2014, we are posting weekly extracts of writings on war and warfare drawn from our manuscript and printed collections. Ranging from items on the Maratha wars to the Second World War, the extracts will reflect opinions both from the battle front and from those at home. The quotes tie in with the exhibition ‘When “the days of conquest are passed”: reflections on war and warfare’, until recently on display at the Special Collections Gallery. The battle of Balaclava was fought 24 October 1854. The port of Balaclava was crucial to the allies to maintain supply lines for their siege of Sebastapol against the Russians. The most famous part of the battle, the infamous charge of the Light Brigade, resulted in devastating losses of men and horses. It was such a traumatic event that the allies were incapable of further action that day. “The mismanagement and stupidity, if not utter negligence, at Balaklava, have caused a great amount of loss of life, of property and health. This was excusable at the outset; it is not excusable now, when the government knows all these things. First described by French army surgeon Dominique Jean Larrey, trench foot is a medical condition caused by prolonged exposure of the feet to damp, unsanitary and cold conditions. If not treated, it can lead to a fungal infection, and eventually gangrene, which can result in amputation. Acts of prevention include keeping feet clean, warm and dry. During World War One, regular foot inspections acted as a key deterrent, as well as pairing soldiers up. Each soldier in the pair would be responsible for the feet of the other. The application of whale oil was also done to prevent this foot condition. Christmases for many years to come would be different following the introduction of rationing. Following limits on the supply of petrol, food stuffs were the next items to be restricted: as from January 1940, sugar and meat were rationed for 14 and 15 years respectively. Meanwhile, overseas, the Nazis had been given use of a submarine base near Murmansk, a city in northwest Russia, close to her borders with Norway and Finland. As of March 2014, we are posting weekly extracts of writings on war and warfare drawn from our manuscript and printed collections. Ranging from items on the Maratha wars to the Second World War, the extracts will reflect opinions both from the battle front and from those at home. The town of San Sebastián was capture by assault on 31 August 1813. As the Allied forces entered the town, the French retreated to the security of the castle. As was the case at Badajoz, the victorious soldiers indulged in drunkenness and plunder while their officers attempted to enforce discipline. Meanwhile, fire from the artillery bombardment swept through the streets of the town and after several days only a small number of buildings remained. The castle capitulated on 8 September. Many of the troops who died in the Crimea did so as a result of disease and 7,000 were lost before the first significant battle of the war in September 1854. Throughout late July and August 1916, Guillemont, which was on the right flank of the British line and the French Sixth Army boundary, defied repeated British attacks. Another major attack was made in early September, commencing with bombardments on 2 September. The main assault began on 3 September and fighting lasted until 6 September when a major portion of wood was secured. Following the devastation caused by the dropping of the atomic bomb on Hiroshima and Nagasaki on 6 and 9 August respectively, Japan surrendered to the allies on 15 August 1945. The surrender was based on the terms of the declaration to end the war, set out at the Potsdam Conference, 17 July-2 August 1945. Lord Mountbatten, who as Supreme Allied Commander South East Asia oversaw the capture of Burma from the Japanese and received the Japanese surrender at Singapore in September 1945, attended the Potsdam Conference. In the press statements below Mountbatten recalls being told about the dropping of the atomic bomb and reflects arrangements for occupation of Japan and of territories formerly occupied by Japan. The Battle of Vimeiro took place on 21 August 1808, four days after the Battle of Roliça. After the success at Roliça, the Anglo-Portuguese army faced a much larger French force led by Major General Jean Andoche Junot, near the village of Vimeiro. While the French attempted a series of flanking manoeuvres on the weakest point in the British position, they were badly coordinated and were repulsed by Wellesley’s forces. The battle resulted in a decisive Anglo-Portuguese victory and ended the first French invasion of Portugal. However, the subsequent agreement made with the French, the Convention of Sintra, allowed their defeated army to return to France complete with their supplies and loot. This caused a massive outcry in Britain and led to Wellesley being recalled from Portugal to face an inquiry, together with Generals Burrard and Dalrymple. While the agreement ended the active military careers of Burrard and Dalrymple, Wellesley returned to command the British army in Portugal in April 1809. The Battle of Delville Wood lasted from 14 July to 3 September 1916. Allied aims were to secure one of the small prominent woods which would provide a strategic gain to direct artillery fire and to launch further attacks. The allies suffered a devastating amount of casualties. In addition, the British advance to the north only achieved negligible gains by the close of the battle. The war afforded the government wide-ranging powers of censorship and press censorship was used to ensure that the conflict was presented in a pro-Allied light. The War Propaganda Bureau was created in September 1914, its dual role being to maintain morale at home and combat German propaganda. British propaganda during this period was generally considered to be more successful than its more strident German counterpart. At the outbreak of the First World War the British Nationality and Status of Aliens Act was introduced which required, all aliens over the age of 16 to register at local police stations. They had to demonstrate a good character and knowledge of English. In part this was due to a fear of spies. The Battle of Roliça was the first battle fought by the British army during the Peninsular War, and marked Sir Arthur Wellesley’s first victory of the campaign. The battle took place on 17 August 1808 as an Anglo-Portuguese army under Wellesley marched towards Lisbon following a French force under the command of General Henri-François Delaborde. Delaborde had been ordered by General Jean-Andoche Junot to hold the Anglo-Portuguese until his larger army was ready to fight. Delaborde’s outnumbered French force took up a defensive position near the village of Roliça where they repulsed three enemy assaults before being forced to withdraw. While Wellesley’s attitude towards his troops varied throughout the subsequent campaign, on this occasion he offered high praise for the gallantry of his troops. On 4 August 1914 Great Britain entered the First World War, declaring war on Germany after Germany had invaded Belgium and Luxemburg. Orders had been given in Great Britain the previous day for troops to mobilise and by the 7 August the first British Expeditionary Forces had landed in France. At the outbreak of war the Territorial units, which were the reserve of the British army, were given the option of serving in France. Many battalions volunteered, but as there was a question of the availability of Territorials for service overseas on 11 August a call was made for the first 100,000 men to enlist in Lord Kitchener’s New Army. It was a call that was answered within two weeks. Not everyone was willing to take up arms to fight and there were an estimated 16,000 conscientious objectors in the First World War. Within this number were those who were willing to serve as “non-combatants” and such service could take the form of work as stretcher bearers or ambulance crews on the front line. Such work was hazardous, as bullets, bombs and shells did not distinguish between combatants and non-combatants. Prince Louis of Battenberg assumed the post of First Sea Lord of the Royal Navy on 8 December 1912. As First Sea Lord, he was responsible to the First Lord of the Admiralty, Winston Churchill, for ensuring the readiness of the fleet and the preparation of naval strategy. In response to the events of July 1914, Battenberg was instructed to bring the navy’s ships to a state of war readiness. While the move was criticised by some at the time, it did prove beneficial once war was declared. In the passage below, written on the eve of Britain declaring war on Germany, the First Lord requests authorisation to make preparations for the defence of the British Channel. “In consequence of declarations in the House this afternoon, I must request authorisation immediately to put into force the [combined] Anglo-French dispositions for the defence of the channel. The French have already taken station and this partial disposition does not ensure security. The declaration of war on Germany caused a great deal of distress among the British public. In particular, it had a sudden impact on dependents of reservists called upon to serve their country, as well as individuals who became unemployed or suffered a loss of earnings as a result of the war. On 7 August, the Prince of Wales announced the formation of a National Fund to provide relief in such cases of distress. Rather than being administered through a central office, the Prince of Wales National Relief Fund worked through Local Relief Committees with the assistance of existing charities and relief organisations. In the case below, a circular letter was sent by the Mayor of Stepney to the Jewish Board of Guardians requesting their assistance in the distribution of relief. 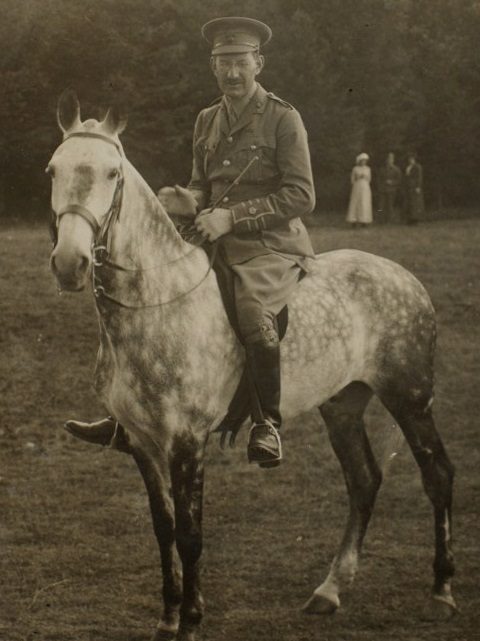 Hope Bagenal was one who felt that he could not bear arms, instead serving with the Royal Army Medical Corps on the Western Front, 1914-16, before being seriously wounded at the Somme in 1916. “I thought about the matter, and I do not think I am wrong. I could not have joined last week… By Saturday all the London Territorial Regiments were full and had long waiting lists… I found at a meeting at the Red Cross last night that names of men were wanted for stretcher bearers to begin training at once, also for those willing to go abroad when called upon. I have put my name down for both and go to practices in the evenings. There were not many names. At the Battle of Vitoria, on 21 June 1813, Arthur Wellesley, first Marquis of Wellington, broke the French army of King Joseph Bonaparte and Marshal Jean-Baptiste Jourdan near Vitoria in Spain. However, in the aftermath of the battle, his troops broke their ranks to loot the abandoned French wagons. While Wellington often praised the gallantry of his troops he was well aware that the pressures of warfare all too often lead to such bouts of pillaging. This particular incident led him to write his now famous dispatch to Earl Bathurst, referring to his men as the “scum of the earth”. “It is quite impossible for me or any other man to command a British army under the existing system. We have in the service the scum of the earth as common soldiers, and of late years we have been doing every thing in our power both by law and by publications to relax the discipline by which alone such men can be kept in order. The officers of the lower ranks will not perform the duty required from them in order to keep their soldiers in order and it is next to impossible to punish any officer for neglects of this description. As to the noncommissioned officers as I have repeatedly stated, they are as bad as the men; and too near them in point of pay and situation by the regulations of late years to expect them to do anything to keep the men in order. As the Anglo-French operations in the Battle of the Somme commenced on 1 July, extracts from the diary of Revd Michael Adler, senior Jewish chaplain to the British Expeditionary Force, recorded some of the human cost of this military action. Taking place in Somme (Picardy, France), the Battle of Albert encompassed the beginnings of the Anglo-French operations in the Battle of the Somme. Lasting from 1-13 July 1916, it began with an attack made by the Anglo-French Infantry on the south bank from Foucaucourt to the Somme, and from the Somme north to Gommecourt. Despite the Infantry achieving a significant victory on the German Second Army, the British attack from Albert-Bapaume road to Gommecourt resulted in approximately 60,000 British casualties. After failing to capture the Spanish border fortress of Badajoz in the spring of 1811 a second attempt began in May the same year. Once again the main focus was on the fort of San Cristobal. After four days of bombardment a sizable breach had been made in the fort and an assault was attempted. However, unaware that the French had removed all of the debris from the ditch, the British assaulting party were unable to find any part of the wall low enough for their ladders to reach and the assault ended in failure. After further bombardment and a second failed assault, Wellington was forced to abandon capturing Badajoz until a third, successful, siege was attempted in 1812. The war took a downward turn for the allies during 1940. On 9 April, German forces invaded Norway with the aim was to capture Oslo. They failed to do this and the Norwegian royal family, the cabinet, and most of the 150 members of the Storting (parliament) made a hasty departure from the capital by special train. On 10 June 1940, Benito Mussolini, leader of Italy, declared war on France and Great Britain. The allied reaction was swift: in London, all Italians who had lived in Britain less than 20 years and who were between the ages of 16 and 70 were immediately interned. In America, President Roosevelt broadcast on radio the promise of support for Britain and France. On 4 June 1915 the third battle of Krithia began at Gallipoli. This event signified the final attack against the Ottoman defences, with the aim of enabling the capture of Alçı Tepe (Achi Baba) which controlled the majority of the peninsula. The result was an Ottoman victory, with the British only achieving little gains in ground. The poet Martin Bell turned twenty one in 1939. He served from 1939 to 1946 initially as a medical orderly and later as an instructor in Lebanon, Syria and Italy. Much of the poetry he wrote during that time and indeed his correspondence and diary entries portrayed a longing for his home town and a resentment of military service. He openly acknowledges this in much of his correspondence. The correspondence of Frederick Dudley Samuel provides an insight into the realities of conditions on the front line with the British Expeditionary Force in France. Correspondence to his wife can be found for almost every day between 1915 and 1918, depicting how much he missed home life. At the Battle of Vimeiro, 21 August 1808, the British army under General Arthur Wellesley defeated the French near the village of Vimeiro, putting an end to the first French invasion of Portugal. On 7 March 1809 Wellesley submitted his Memorandum on the Defence of Portugal.